The new ‘professionalized’ Al Jazeera will not solve democratic deficits in US public media – We need a revolution. Thousands of jubilant news professionals are tossing their hats into the air and their resumes into Al Jazeera’s inbox because Al Jazeera America, a new international cable news channel, is launching this summer. But while they celebrate, Tavis Smiley, Cornel West and Amy Goodman call for a democratic revolution to transform public media. That’s funny. Not too long ago, Tavis Smiley voiced something similar about another award-winning, public service news outlet -- WBEZ Chicago Public Media: “Something is wrong when even public media has become the playground of the 1%, when public media has become a wholly owned subsidiary of the 1% rather than speaking to the trouble and travail and tribulation of the 99.” Smiley was speaking at a media and democracy forum entitled “Poverty, Power, and the Public Airwaves: Post-election analysis and commentary from Tavis Smiley, Cornel West & Amy Goodman in Chicago". The event came about as a result of public opposition to WBEZ’s decision to cease airings of “Smiley & West”, perhaps the only program consistently advocating for the poor and marginalized on over 70 public radio stations. A few scattered stations had dropped the show previously. The controversy mushroomed when Smiley responded to WBEZ and CEO Torey Malatia in turn called the show “crap”. WBEZ’s decisions forced “Smiley & West” onto two local commercial niche stations with a combined average audience one third smaller than WBEZ’s. How should this be interpreted by marginalized groups the station is supposed to serve? Smiley declared, “(I)t is easier for an African American to be president of the United States than it is to host a primetime radio program on Chicago Public Radio.” In classic Orwellian newspeak, WBEZ claimed it was acting in the interest of “inclusiveness”. (See also Steve Rendall, Feb. 2013 FAIR “Extra!”, [subscription required].) This type of thing is old news to WBEZ; Malatia was also in charge back in 2003 when Fairness and Accuracy in Reporting cited WBEZ for having no daytime weekday programs with non-white hosts. Similarly, how ought WBEZ’s purchase of WRTE-FM, the only low power Latino radio station in the Chicago area, be understood? Al Jazeera and WBEZ are guided by lofty ideals, but only sometimes. What can be done to hold them to account to those ideals? I took a closer look at both WBEZ Chicago Public Media and Al Jazeera America and what I found confirms the need for an in-depth examination of the governance of U.S. public media -- and the need for a wide distribution of the findings. How is Al Jazeera funded and controlled? Qatar is the host of immense natural gas reserves, much U.S. investment, and key forward U.S. military bases. It is best not to view Qatar as a country with a government, but instead as a royal family’s business interests and a massive guest worker program; the “sovereign wealth fund” includes the Treasury. Qatar provides very little public data on the finances and governance of the privately held corporate parent Al Jazeera Media Network and its 20 or so channels. Al Jazeera’s news channels air very few ads and that is a BIG problem for the U.S. cable distributors and Al Jazeera America -- even though these same cable companies pass domestic public tv through their wires without feeling the need to interrupt programming. Al Jazeera says “the plan is to work quickly toward a self-sustaining business model.” In a little-reported 2011 decree, the Emir said Al Jazeera Network, a public institution, would become Al Jazeera Media Network, “a private institution of public utility”. That year, its advisory "International Board of Visitors" consisted of a range of professional journalists and a few financial and political elites with media ties, but no representatives of working or low-income persons or other marginalized groups. The network’s current director-general is a member of the country's royal family and has no background in journalism. What do those knowledgeable about news and propaganda think about the new Al Jazeera? Adel Iskandar, Georgetown University lecturer and co-author of the book “Al-jazeera: The Story of the Network that is Rattling Governments and Redefining Modern Journalism” said, “The Al Jazeera of 2010 is not the Al Jazeera of 2013… We’ve seen the departure of various people at the network who claim that it no longer practices independent journalism.” Former BBC reporter Ali Hashem resigned his post at Al Jazeera Arabic saying, “The Qataris… are forcing Al Jazeera to commit suicide.” Tellingly, Iraq invasion co-architect and former U.S. Secretary of Defense Donald Rumsfeld told David Frost on Al Jazeera English in September of 2011 that he was “delighted” by the new Al Jazeera. Today’s Al Jazeera English is basically like some previous version of the mediocre and flawed CNN but with more emphasis on the global south. U.S embassy cables released by Wikileaks say the U.S. Embassy in Doha, Qatar and officials from Washington have been using a variety of direct and indirect methods to increase Al Jazeera’s compliance. Perhaps surprising to advocates of impartial professional journalism, the primary tool to restrain critical reporting on the Qatar network is repeated monitoring and training. Closer to home, WBEZ Chicago Public Media, like Al Jazeera, also relies on claims of professionalism to discipline journalists and police the politics it broadcasts. In late September of 2012, deep in the election season, WBEZ cancelled “Smiley & West” without bothering to call Smiley to talk about it first. Station officials cited ratings as a cause but argued, “more importantly, the show had developed much more of an ‘advocacy’ identity” and on this point, station CEO Malatia compared “Smiley & West” to the Pacifica Radio program “Democracy Now!” -- a daily independent broadcast news and discussion show hosted by Amy Goodman that airs on over a thousand public and community stations. Malatia then also compared “Democracy Now!” to “The Rush Limbaugh Show”, a choice that lead to a sharp public response by the democratically-elected Pacifica radio governing board. When WBEZ first announced the cancellation, I created the Facebook page, “Smiley & West dumped by WBEZ Chicago Public Media: Take Action." That page contributed to public pressure and discussion of the events. Smiley publicly addressed that discussion in his uncompromising open letter to Malatia. Smiley’s letter charged that there are systemic problems at U.S. public media’s core, particularly regarding problems with race and class exclusions on station governing boards. In the face of this growing public criticism, Malatia called the Smiley & West show, “crap.” The growing public debate won mainstream and independent news coverage, adding to interest in the November 8th forum at Northwestern University Law School's Thorne Auditorium. Over “a thooouusand” (as Amy Goodman might intone) attended. Including this writer. At the public forum, Smiley called Chicago “ground zero” in the fight for democratic accountability over public media. He also joined West and Goodman to call for grassroots action to democratically transform public media right now. "We ain't got but a couple of years. . . to let our voices be heard and I don't want us to wait too long to figure that out. . . Public media is going to have to be pushed. . . [Y]ou can get a conversation started about how we democratize and bring some diversity to public media." Goodman made it clear that the role of an active public is necessary to win programming that challenges corporate and political power. "These are your public airwaves and you have a right to determine how they're used. . . What are you going to do about it?” Goodman also pointed out that corporate employed or funded professional stations depend on and enable their corporate backers. Later that same night on PBS Goodman stated, “I can’t think of a greater group of advocacy journalists than those in the corporate media." "John Dewey [said] Show me a democracy that has a impoverished public life and I'll show you one that is dominated by oligarchs and plutocrats driven by profit maximization,” said Cornel West as he connected the problem of elite control of media to the crippling of democracy, “There's no way. . . we’ll ever be able to reinvigorate and rejuvenate our public life unless we have (as Socrates told us) Parrhesia. Parrhesia is fearless speech, plain speech, frank speech, unintimidated speech. . . There’s too much mendacity and lyin' going on in the corporate, truncated, multiplex.” West made it clear that the fight over media is not merely over truth but over a fundamental recognition of the right of people outside of elite circles to shape media to defend their legitimacy as democratic actors and their material interests in social life: “We need a revolutionary change that shifts from the power of oligarchs to the power of everyday people. And you do that democratically, step by step." The citation of John Dewey is strikingly appropriate. His scholarship recognized that participation in communication and education are necessary to create and keep a vibrant democratic commons. In Chicago, as elsewhere, the commons of public media and public education are besieged as never before by an epidemic of corporate engineered privatization. Part of that attack is to de-legitimize any role of regular people in shaping the media and education systems that they rely on. West and Goodman gave shout-outs to the Chicago Teachers Union and its President Karen Lewis, who was in attendance. The CTU is organized using direct democratic practices and pursues the return to public election of the Trustees of the Chicago Board of Education, a franchise lost over fifteen years ago. In my observation, journalists at WBEZ rarely initiated discussion of public school governance. WBEZ coverage seemed to find the notion that regular people could participate in shaping public policies unthinkable (or insulting). 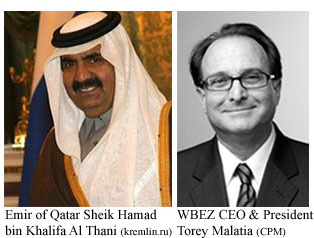 In fact, the public also has no direct say in the selection of WBEZ Chicago Public Media’s Trustees. The “Smiley & West” incident in Chicago created a ruckus in corporate and independent media and new public discussions emerged outside traditional media that put the public media establishment on notice. But the incident failed to create some kind of member or publicly elected WBEZ governing Board. Nor did we see the birth of a mass movement to create such a body or win the right to participate in shaping the media we need to defend other public treasures, like our schools. The fact that Smiley, West, and Goodman called for such a revolution was hardly noticed by the broader debate in alternative or mainstream media. But such a revolution is what is needed to create the public commons. Almost every other model to "save journalism" fails to interrogate professional claims of impartiality and winds up reproducing the old chain of command that separates disadvantaged communities -- people of color, the poor and working classes, political dissidents, LGBT communities, and other groups -- from decision making. Synergizing community and other public media producers into a new, publicly controlled, radically reorganized, public media system could enable social justice movements to change social conditions for the better. At the November 8th event, I asked a certain famous Chicago advocate for community controlled public education, reparations, the late Mayor Harold Washington, and fancy hats, if she thought most average people believe that the Trustees on the boards of large public media outlets are all friendly and nice -- like Big Bird. She said she wasn't sure. Had I asked her if she thinks the average person knows the rules by which these Trustees make decisions, she might have offered the same response. We need to expose those rules so that people understand the means by which the rich corporate class controls the development and content of public broadcast systems and in-progress digital public online networks. The shape, and politics, of those networks will be powerfully affected by the National Broadband Plan (NBP). The force of federal law, through the American Recovery and Reinvestment Act of 2009 (ARRA), mandates the NBP to provide for the transformation of the 20th-century U.S. public broadcasting system into a digital public media network, ubiquitous in access, promoting innovation, competition, and free expression, and supporting the growth of accountability journalism. Subsidies for a variety of anchor institutions and other community-based entities are actually crucial for reaching these NBP goals. But, with scarce exception (i.e. stations controlled by local tribal governments and the five Pacifica radio stations), the recipients of these Corporation for Public Broadcasting subsidies charged with the creation of those networks are not grassroots community anchor institutions and they are not led by the principles of direct democracy. The governing boards of the CPB stations will make the decisions and set the conditions under which community organizations get to participate in creating those necessary networks. Increasing public knowledge of the political forces controlling development of publicly funded digital networks could offer advocates a pro-active opportunity to shift public and policy debate from a narrow focus on station budgets to a larger question: Should federal policy enable the same corporate and affluent sectors culpable for the recent economic crisis to also shape development of new public communication resources needed by communities disproportionately hurt by that crisis? Important research on public media policy is already out there (New America Foundation, Center for Social Media, Victor Pickard et al, Ellen P. Goodman and Anne Chen). But the fact is we also need research into the political relationships enabled by the new networks: will corporate connected elites again manage the money and make the decisions? Above all we need a social movement to raise hell and win the right to shape public media to meet the needs of regular people. As our very good friend Tavis Smiley said in The Chicago Defender: "Now is the time to ask and answer the hard questions on how the public media space can better serve fellow citizens who have traditionally been politically, economically, socially, and culturally disenfranchised." The clock is ticking. We cannot -- we must not -- rely on the largesse of royalty and the “corporate, truncated multiplex” for the connections, communications, and news needed for a public commons and a living democracy. James Owens made invaluable contributions to this article. Scott Sanders, a 2011 winner of the Nelson Algren Committee award, has co-founded a number of media activist organizations, including Chicago Media Action, and led efforts to constitute public community media centers with member-elected boards and to increase diversity on non-elected public media boards. He also led campaigns resulting in the only FCC fine of a major public TV station concerning commercialism. He has a number of years of experience working as a video documentarian and as a periodicals and technology librarian. Scott has produced social science research for MMTC, MAP, and, for the last four years, for the University of Chicago. He is responsible for the Trustee research in the CMA study “Chicago Tonight: Elites, Affluence, and Advertising” starting on p.18 here. He is the author or co-author of articles for Truthout, Extra!, Counterpunch, Z magazine, and a number of daily newspapers. In memory of Jan and Robert Sanders.